Just a few words of thanks to all of you who come here to read my blog and share this journey with me. Whether you get here on purpose or by accident, I hope you’ll stay a while and join the conversation! Every time I get a new follower, I am truly grateful! 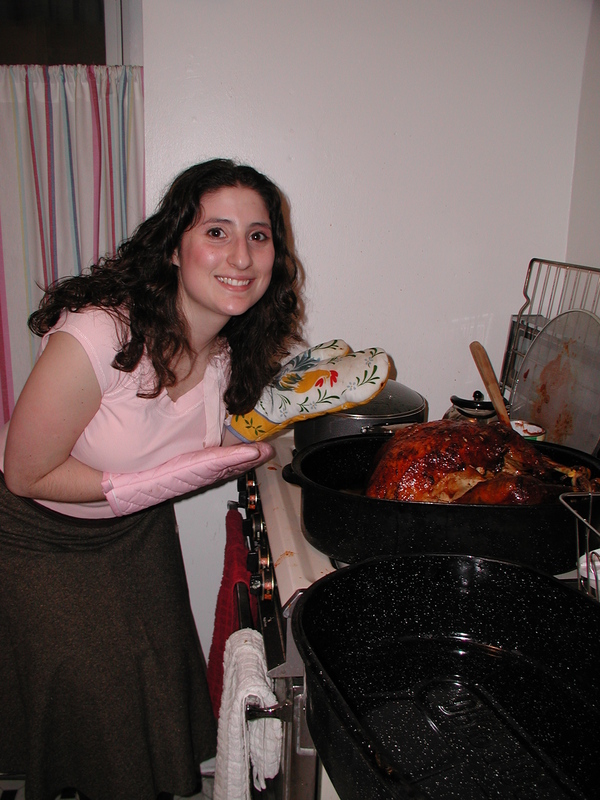 The first turkey I ever made, with the assistance of my sous chef. This holiday I’ll be cooking turkey and doing my best to enjoy all the food without going overboard. I’m also going to give extra hugs to my loved ones that I am so thankful for even if they already know how much I love them. You can never hear it and feel it enough. Win this now! Sign up for my newsletter to win! Check out this month’s newsletter for Traveling Tips and a preview of My Cookbook! So my mother’s response to my bucket list item was, “Yoga in Israel? On the List? Really???!!! !” (I may have added some punctuation here but otherwise it’s a direct quote). Well, yeah, yoga in Israel, On the List. Really. I started practicing Bikram Yoga in 2008 on the recommendation of a dear friend of mine who is a dancer and definitely more in shape than I am. She suggested I try it in advance of my trip to Israel so I’d feel my best on my trip. I barely made it through my first class (almost passed out 2x), but I did make it, and I went back for more. When we left for Israel, I had done some google searching and found out that there were 2 places to do Bikram yoga in Tel Aviv and there were even classes in English! I definitely was going to go. If ONLY my head touched the floor this easily! But then, you know, LIFE happened. I got scared and I chickened out. I had no idea how knowing absolutely ZERO Hebrew was going to kind of be a problem. I was to scared to go alone and my husband (and travel partner) was not yet ready for the challenge. So I packed the yoga clothes for nothing. Oh well. In 2009, I had another trip to Israel and though for sure THIS time I would make a trip to the yoga studio, but it never happened. I was too busy socializing and eating and shopping to fit in a 90 minute class. Another dusty pair of yoga shorts went unused. Now, four years later, we are finally back in Israel. I have a regular yoga practice and my travelling companion (read: reluctant Ran) had PROMISED to go with me. This time it was much harder to find any information on the internet, and the phone numbers were out of service. 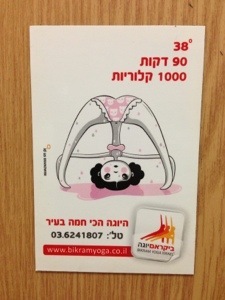 What had happened to Bikram yoga in Israel? Was it gone? Had it failed to gain traction here just like Starbucks? I was starting to panic! I thought, “I had 2 chances to go to yoga and I squandered them!”. Luckily, Ran remembered an acquaintance on Facebook who often posted things about going to Bikram yoga. So through the magic of the internet, Ran messaged her and was able to get all the details on where/when and which teachers could speak enough English so I could get through the class. She was a God-send! She told us that at 10am Sunday she would be going to class with one of the best teachers and we could meet her there. It sounded like a great plan on Saturday night. So I woke Ran and told him we gotta make a decision pronto! Because we need to leave in 20 minutes if we are doing this thing. He said, “I’d rather go now than later today.” And with that I decided, “Let’s go man!” We dressed and got out of the house as quickly as possible and go ton the road. We drove as fast as we could, and even still we were cutting it very close. We got there with about 10 minutes to spare, so I jumped out of the car to go do our paperwork and reserve our places in class while Ran searched for parking. Parking in Tel Aviv is on par with parking in NYC, so there is none. So Ran had to park in a business high-rise where the Israeli KPMG offices were (to the tune of 67 sheckels – about $25). He also parked several blocks away and had to run the streets of Tel Aviv to make it in time for 10am class. Bikram classes are notorious for being punctual and they do not allow late comers. While Ran was parking, I went into the building and realized, I didn’t know what floor the studio was on, and the signs were only in Hebrew so I was He-screwed. My plan was to take the elevator up to each floor and investigate but then someone came in behind me. I asked him to read the sign for me, but he said, “No yoga.” I was sure I was in the right place, but honestly, I had no idea! The second man who came in after me totally had a “yogi-vibe” and he told me yes there was yoga and I could follow him there. Whew! I was in, finally! I was finally going to take my first international Bikram yoga class! I just kicked my yoga practice up a notch. The class was great. I was able to understand most of what was happening (even though it was in Hebrew) because Bikram yoga is the same 26 posture the world ’round. I could even kinda figure out what the teacher was saying because I know the dialogue so well. I decoded the words for “lock the knee” and “breath in”/”breath out.” I felt worldly! I’ve gone to yoga on vacation once before, but that was in Florida. It was still fun and felt great to be exercising on vacation. Vacations can be sinkholes for calories. You just eat out so much and really let loose. It can be great fun but really hard to come back from once the vacation is over. I find that fitting in a little exercise makes me feel like I am just thatmuch more on top of things than I would have been in the past. Taking this practice International was truly one of the things on my bucket list. I wanted to experience a class in another language and also be out of my element a little bit. It freshens things up! Especially when you take the same class for 5 years! If you get the chance to exercise on vacation, I highly recommend it. In this case I treated it as touristy thing to do because I got to take a class overlooking Tel Aviv and observe how Israelis did Bikram yoga. Instead of chickening out and being afraid, I just went for it. And believe me, during that first breathing pose, I was cursing myself. Why am I here? Why do I do this to myself? I hate this pose, blah blah blah. But then I reminding myself (as I do at every class), that is its a privilege to be there and I am very lucky to have the opportunity to be in the class on that day and that moment. So just breath in and breath out and enjoy. Juicy Deliciousness Up for Grabs! I’ve had the privilege to partner with Fruit Bliss on a giveaway for everyone who signs up for my The Family Plate newsletter by November 28th. Click Here to Enter. 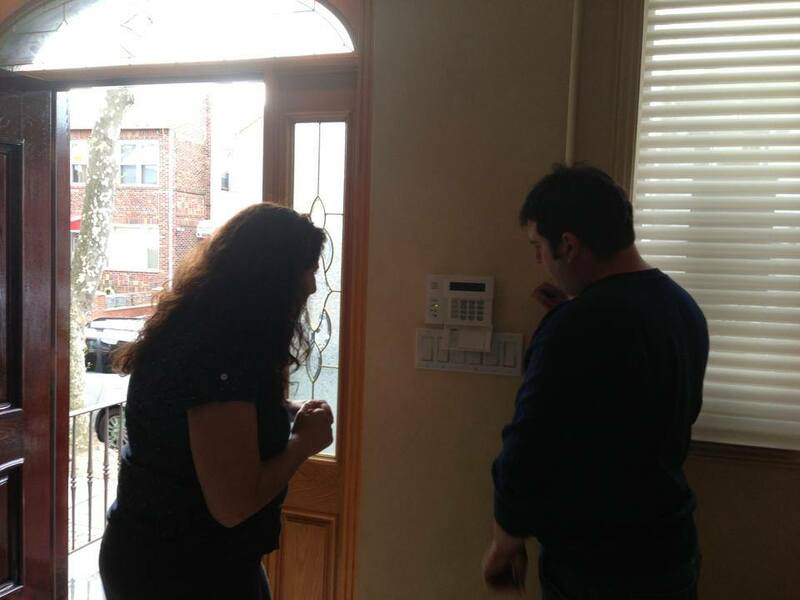 Winner announced on November 29 – Black Friday! If you want 2 chances to win – it’s easy! Just “Like” Fruit Bliss on Facebook here! 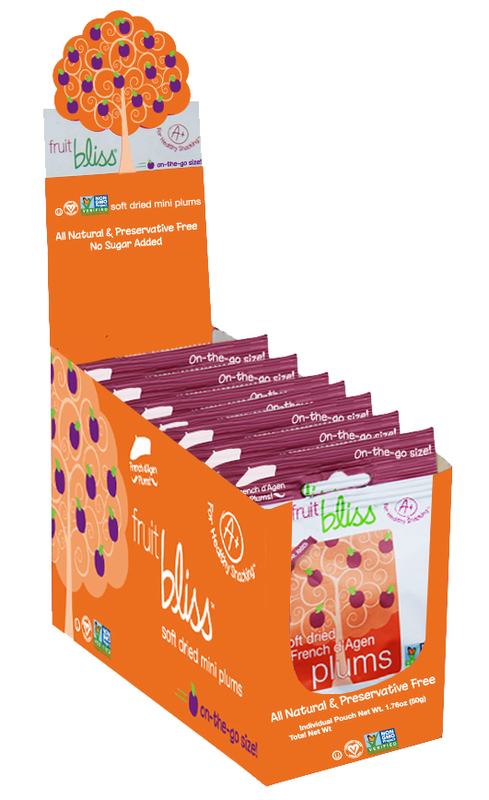 Since the holidays are upon us, we’ve decided to giveaway some healthy fruit snacks from Fruit Bliss that are individually wrapped. This way, you can throw them in your bag and have a snack on hand when out shopping at the mall all day or cooking all day for the holidays. 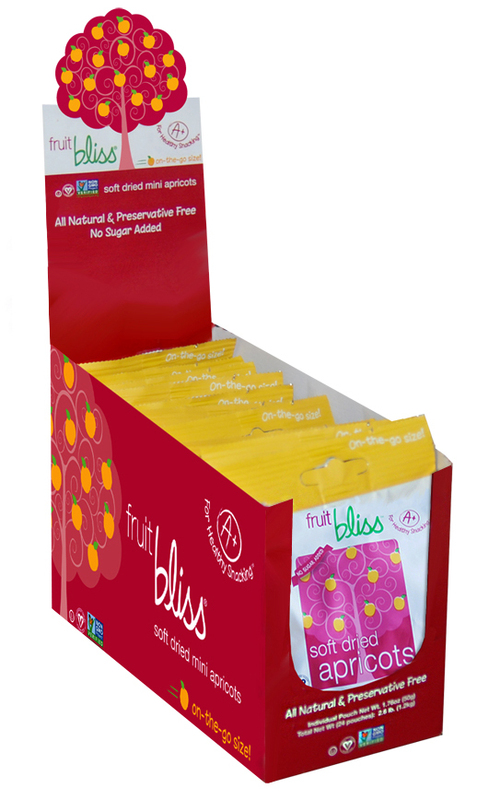 We’re giving away 36 individually wrapped pouches of fruity deliciousness. That’s a snack for every day from Thanksgiving to the New Year! We will ship your winnings directly to you! So you can start enjoying Fruit Bliss asap. Click Here to Enter. 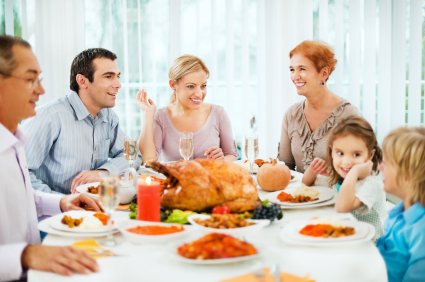 If you’re planning on getting out of town this holiday season and don’t want to fall victim to unhealthy choices and unplanned weight gain, check out these tips to stay the course this holiday season! Usually, I’m in town for the holidays because most of my family is right here in New York. It makes it a bit easier to handle the holiday temptation, because after 1 day it’s back to reality. But this year we are actually headed overseas for 9 days which include the mega holiday Thanskgivikah! We’ll be out of our element for the whole time. I definitely don’t want to derail all my progress for 2013, so I wanted to come up with some tips for those of us who want to stay the course during this holiday season. 1) Prepare food ahead of time – It’s not the sexiest tip in the world, but it works! Plan snacks for the car like trail mix or sliced veggies. I love sliced bell peppers with hummus. If you have a small cooler bag, fill it up with snacks so that you don’t have the urge to stop at the rest area quite as often. I use my cooler bag all the time for car trips because we can also keep our water bottles chilled. But it’s also great for packing snacks that are elevated beyond pretzels and chips. Take the time, you will be glad you did when you don’t have cheesy powder all over your hands from Cheetos. 2) Avoid the “Meal Deal” – You may be forced to stop at a rest area if your trip is long enough and if you’re flying you’ll definitely be faced with fast food in the airport. Since I’m one of the dozen people on the planet who don’t like French fries, I usually avoid the “meal deal” at fast food restaurants naturally. I encourage you to do the same. Get the sandwich of your choice and then opt for water or seltzer and a side salad. Wendy’s has some of the best side salads that I’ve tasted, but they are becoming ubiquitous in the fast food world to offer you more healthy options. By steering clear of the “soda, burger, fries” routine, you’ll feel lighter and be happy you got in a serving of vegetables from your side salad. 3) Drink plenty of water – Staying hydrated is key to feeling satisfied. If you are hydrated, you are less likely to overeat. Sometimes our body is thirsty but we interpret that as hunger and eat calories we don’t need. Especially if you are flying, make sure to drink water as often as you can. Airplanes are known for dehydrating us both inside and out (ladies may want to put on extra moisturizer), so plan accordingly. Bring your reusable water bottles and don’t be afraid to ask for refills. Having your own water bottles on hand is also eco-friendly and cost-friendly (no more paying for bottled water!). 4) Get Active! – If getting to the gym isn’t in the cards while you’re away consider adding in some activities that get you up and moving. Take a walk, go hiking, or play hide and go seek with the kids. Any activity that gets you off the couch will help you feel better once it’s time to sit down and eat that third serving of stuffing. If you can get to the gym, do it! Bring sneakers and go for a new class. I’m planning to go to a Bikram yoga class while I’m out of town to see how they do it overseas as part of my “touristy activities”. Last but not least, cue up any number of the DIY workouts on you tube and do it in your hotel room or host’s basement. Even 10 minutes a day will be worth it. Remember working out not only burns calories, but it also de-stressed you and raises your endorphin levels which might be just what the doctor ordered if your family is like the family in any holiday movie (read: crazy but lovable). 5) Cook When You Can – If you’re at a family member’s house for the holidays maybe they’d be happy to turn over the kitchen responsibilities to you for 1 or 2 meals. Cook up meals that you can easily double, like Turkey Chili, so you can have plenty of leftovers in the fridge. This way you can avoid eating out for 3 meals a day and have some healthy meals among the pumpkin pie ala mode. Just be prepared to also tackle the clean up! Fruit Bliss Giveaway worth over $40! I guess like most people who go to college and study theatre, I’ve often thought about what it would be like to be famous. Would I be gracious when people stop me on the street? Would I give generously to charities? Would I do Nespresso commercials but only overseas? I know for sure I would remember to thank my husband when I win my first Oscar. All kidding aside, I loved my time on stage and hope that someday I can go back to it, but for now, I’m really happy with my new profession of health coach and all the people I get to work with along the way. It was not only exciting to see my food come to life through the lens but it was amazing to me that I only dreamed up this scheme a few months ago, and now it’s coming to life. It was an idea that once I thought of it, I couldn’t get it out of my brain. I wanted to work on it (without being forced). I wanted to try new recipes. I wanted to get feedback from people. Basically, I wasn’t afraid. It just goes to show you (and me) that when inspiration hits, it really doesn’t feel like work and it can be a source of primary food! That’s “finding your bliss”. 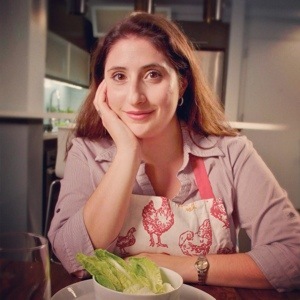 As part of the cookbook I also got the chance to have some new pictures taken of myself in a “cookbook” kind of setting. I wore an apron, had lights focused at me to make me look my best and felt like Julia Roberts. Another Oscar moment for sure! That same week, we filmed a commercial for my dad’s business, Alarms R Us and I played a “yoga student” in an industrial film for my yoga studio. It was lots of cameras, lights and being called “an actor”. 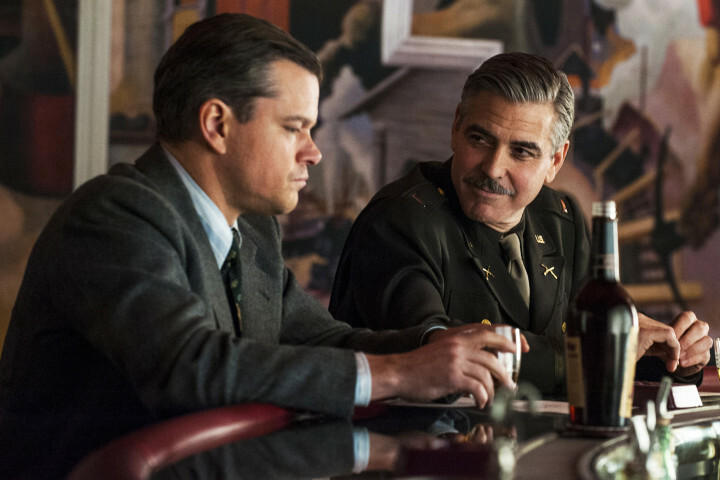 It was such a departure for me, because in all my theatre experience I never really did anything on film. I was so happy to be a part of all of these projects and have a chance to step back and say “Wow! I feel really lucky”. When we do things we love, it’s easy to feel that way. I remember a couple years back, when I was working full time, that on Sunday nights I would have a bit of insomnia. I would lay awake staring at the ceiling which I almost never do. Finally I realized I was having a bit of dread over having to go to work the next day. I wanted to stay up late Sunday night as if to say, “Monday isn’t coming”. When I finally came to this conclusion I had to think about why I was having Sunday night dread in the first place. Finding meaning work or meaning in your work is one of our biggest challenges in life, amiright? Sure, I liked having my pictures taken and being in commercials, but I’ve felt more proud than when I saw my stuffed mushrooms beautifully laid out in a professional picture. It was amazing. And those mushrooms happen to be delicious! So I guess this is my subtle fame, and I’m kinda cool with that. I can’t wait to finish the cookbook and get it out to you all (read: my family a/k/a the ones who read this blog). Thanks for reading!